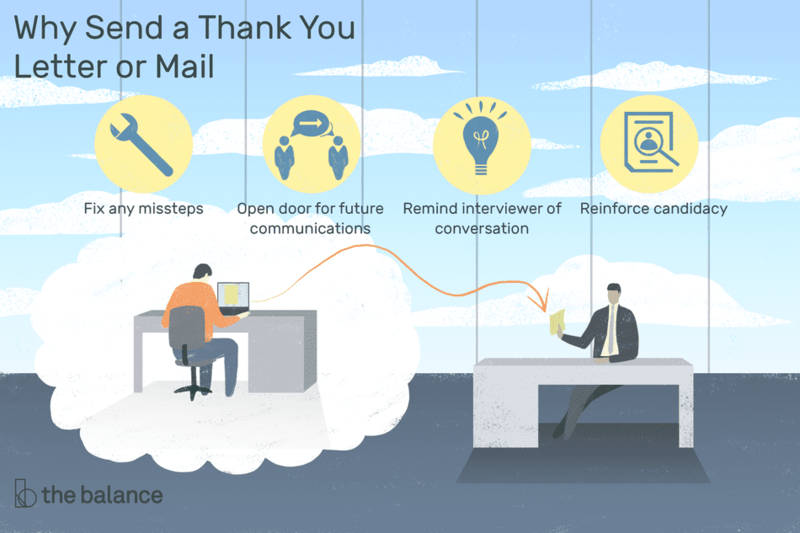 After an interview, whether it's over the phone, through video chat, or in person, you should always send a thank you letter to your interviewer. Sending one is good manners: it's always polite to pass along appreciation when someone takes time from their day for a conversation. Remind the interviewer of your conversation: As part of the hiring process, interviewers often speak with a lot of people, making it easy for them to forget the particulars of each candidate. How can you stand out? A well-written, thoughtful thank you letter reminds the interviewer of your candidacy and is a callback to your conversation. In your note, you can reference specific moments from your conversation. Fix any missteps: Did you flub the answer to a question? Forget to mention something obvious and meaningful? Your thank you note is the perfect opportunity to clean up any mistakes you made in conversation, rephrase anything you put poorly during the interview, and add vital information you neglected to mention. Reinforce your candidacy: As well as seeking to make a connection with the interviewer, so that you are a memorable candidate, it's also important to be clear about why you're a great candidate. What makes you a strong choice for the position? Now that you've spoken with someone at the company, you're likely more aware of what's involved in the position than you were when you initially applied for the spot. Use the information you've gathered during the interview to pinpoint in your thank you letter what you would bring to the company and to mention aspects of the job that particularly appeal to you. Open the door for future communications: In your note, mention your interest in the position. If this is your dream job, say so! Show off your enthusiasm for the position and company, and create an opportunity for the interviewer to ask follow-up questions, request references, and generally be in touch. Below, you'll find examples of a thank you note and letter that are appropriate to send (via email or mail) to the person who interviewed you. If you are sending an email letter, there is no need to include your return address or your contact's address. Do include your name and "thank you" in the subject of the message. List your contact information in your signature. Remember to always personalize your thank you note to the specifics of your interview. A targeted, personalized thank you note is much more meaningful than a generic one. This is a job interview thank you letter example. Download the job interview thank you letter template (compatible with Google Docs and Word Online) or see below for more examples. I sincerely enjoyed meeting with you yesterday and learning more about the content associate position at ACME Media. Our conversation confirmed my interest in becoming part of ACME Media. I was particularly pleased with the prospect of being able to develop my own article ideas with the head of the bureau, and develop my multi-media skills. I feel confident that my experiences both in the workplace and in the classroom would enable me to fill the job requirements effectively. Please feel free to contact me if I can provide you with any further information. I look forward eagerly to hearing from you, and thank you again for the courtesy you extended to me.